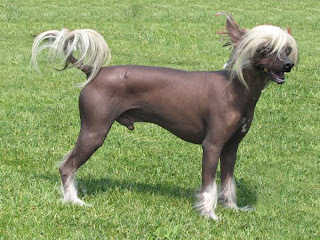 The Chinese Crested dog is a smaller hairless breed of dogs, one of the favorite amongst the people because of its sugary, animated and loving nature. The Chinese Crested, like most other hairless dog breeds, comes in two varieties; the Hairless and Powderpuff. Both the varieties are just different in outer characteristics, but have similar characteristics. The hairless survives better in warm weather, and the Powderpuff which is furry is partial to both warm and cold weather. They have primitive mouth. This may lead to poor dentition which includes missing or crowded teeth and hence the teeth may suffer from decays if not looked after. Canine multiple system degeneration, also known as progressive neuronal abiotropy. They may live for a longer periods of time, approximately 12 to 14 years or even more.